I’m choosing to begin this post on ‘History from Below’ with recent news stories about factory disasters on opposite ends of the world for one reason: to separate wheat from chaff. These kinds of stories should make you angry, they should make you think about why those factory workers felt they had to obey, and stayed at their posts in a factory that was literally crumbling around them, they should invite you to explore the sad history of industrial production, of ‘developing nation’ factory workers, and of brutal, naked economic exploitation in places like Bangladesh. I hope you want to understand why a place like Rana Plaza was openly permitted to exist. I hope you want to know what life was like for the approximately 1,150 people who died because they were not permitted to escape from an imploding building. The most crucial piece of any story is the one most in danger of getting lost, or of getting buried or retold by someone else who has more influence. I hope the metaphor here is not wasted. We should be more interested in the people buried under the rubble of an illegal factory then we should by the factory’s existence. In this way their lives and deaths gain a meaning for us, and in this case, not a happy one. I believe that ‘history from below’ is history which preserves, and which foregrounds, the marginalised stories and experiences of people who, all else being equal, did not get chance to author their own story. History from below tries to redress that most final, and brutal, of life’s inequalities: whether or not you are forgotten. And let me assure you that there are many, many things that we desperately want to forget. E.P. Thompson’s most famous formulation of social history demanded that historians undertake projects of rescue, i.e. that they write histories about people who do not get to write their own, either because they cannot, or because the layers of inequality between them and historical self-expression prove too impermeable. No story, he argued, should be elided by the ‘condescension of posterity’. Thompson’s area of expertise, eighteenth-century England, left us huge archives hugely devoted to the concerns, preoccupations, and properties of the rich. As often as not, the rich also write or commission histories of themselves. The inequalities and systems which enshrine hereditary privilege and power also tend to ensure memorialisation of that privilege and power, and history is replete with examples and artefacts which bear this out. If we attempt a comparative assessment, only a tiny scattering of records give us the words or actions of the poor directly, and with minimal interference, and over the past three or four decades it has been historians ‘of below’ that have recovered those words most assiduously, as often as not from records like the courts, or the notes of magistrates, though sometimes, thankfully, we still find the poor represented by their own words. History from below thus began, rightly, at the bottom. Griffin calls Thompson an ‘unconventional historian’. I call him an activist one. It just so happens that Thompson was also responsible, and one wonders whether it was inadvertent, for the popularising of the phrase ‘history from below’ in a Times Literary Supplement survey article in 1966. Each and every predication made by Thompson in 1966 regarding what would come to occupy more of the stage in history departments proved true. Histories of crime, of popular culture and popular religion, of popular economics, of popular everything are now the norm and not the exception. We might usefully call history from below a form of social history which is defined by its perspective. But it is rare nowadays to find a practicing historian utterly contemptuous of social history and its aims, or wilfully ignorant of its subjects and methods, so one wonders how useful this distinction really is. The term ‘history from below’ itself underwent a kind of reboot in the early 2000s, with historians like Tim Hitchcock and Pamela Sharpe stepping in to offer a ‘new’ version to early modernists, one that hewed as closely as possible to the ‘voices’ ‘agencies’ and ‘strategies’ of poor people in the past. The Old Bailey Online, which is now over ten years old, stands as digital testimony to the foregrounding of individual experience and agency in this ‘second wave’ of scholarship. So, why does history from below matter now more than ever? First, here is what I personally think history must do. History must be our collective conscience. History must be uncomfortable. If history allows you to be complacent, it is not doing its job. History must tell the stories of as many people, as many ways of being in the world, as it can reasonably do. It must do this so that we forget as little about ourselves and our pasts as possible. History must offer the complexity and context of human experiences in the past to the audience of the present. History must be the engine of our collective social maturity. These are not statements that care about precisely how history completes these tasks. I am not debating which sources should be used, discarded, trusted, or distrusted. I’m offering an assessment of the social and cultural purpose of the discipline. The best ‘history from below’ checks all of these boxes. We try to understand the vagrant, the child factory worker, the domestic servant, the radical shoemaker, the slave, and we try to do so on the terms of the lives that they led. In a modern academy balkanised by cuts, tuition free increases, and the cult of the student-as-consumer, this kind of history has the power to inspire and unite. It is not ‘just’ labour history, Thompson made that clear in 1966. It is not ‘just’ the history of the poor, or of any single ‘marginal group’, as any historian of slavery can assure you. To me, history from below is still a project of rescuing, not just from ‘condescension’, from the abyss of our modern regard, as we stand so far above our ancestors, but also from how we choose to treat people we do not understand. History from below is about rescuing stories from the inequalities of collective memory, and national history. Maybe Benjamin said it best. You might be familiar with Walter Benjamin’s ‘angel of history’. If you aren’t, let me introduce you. Here is the famous Klee painting which should always be paired with what is, in my opinion, probably the best description of history ever written. 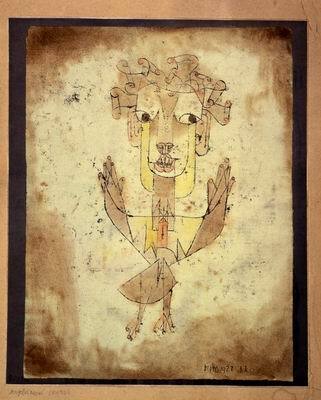 Paul Klee, Angelus Novus (1920). Oil transfer and watercolor. Benjamin fled to Spain, and later committed suicide there. History from below cannot awaken the dead. It cannot ‘make whole what has been smashed’. But by placing the lives and agency of people most in danger of being forgotten in the centre of our regard, by filling the air with their stories, worries, loves, and tragedies, perhaps history from below can calm the storm blowing out of paradise, and give us a chance to rescue meaningful lives from the ever-growing pile of historical ‘debris’ and from the silences, forgetting, and revisions of modernity. After all, there are always ‘poor stockingers’, and Posterity still condescends. E.P. Thompson, ‘History from Below’, The Times Literary Supplement (Thursday, 7 April 1966), p. 279, issue 3345. Tim Hitchcock, Peter King, and Pamela Sharpe, eds. Chronicling Poverty: The Voices and Strategies of the English poor, 1640-1840 (Basingstoke: Macmillan, 1997); Tim Hitchcock, ‘A New History from Below’, History Workshop Journal, 57 (2004), pp. 294-298. Walter Benjamin, ‘On the Concept of History’, Selected Writings: Volume 4, 1938-1940, Howard Eiland and Michael W. Jennings, eds. (Cambridge, M.A. and London: The Belknap Press of Harvard University Press, 2003); p. 392. This is a wonderfully stirring piece, Dave. Without a doubt, the task of remembering and even ‘rescuing’ the lives of ‘people most in danger of being forgotten’ is central to the practice of history from below and, to my mind, a valuable aim in its own right. Nonetheless, I have to ask the obvious question: What can this agenda offer to scholars and audiences who don’t share the assumptions of, to put it crudely, ‘the left’? To give just one example, there are many smart people who would regard the events in Bangladesh and Texas as tragedies that, whilst undoubtedly terrible for the victims, are merely part of a long-term process of development and economic growth that ultimately benefits humanity as a whole. From this perspective, focusing on the victims and the ‘losers’ actually gives us a very skewed vision of history. Clearly I’m playing devil’s advocate here, but I think the question remains. Whilst we might empathise with poor stockingers, how can we make their history matter to those who don’t share our social and political values? Thank you Brodie. Perhaps that is one of the problems with manifestos. When I ask for history to be the engine of our collective social maturity, it is my assessment of maturity that I am calling for. The historian’s purist answer to your point would be that inequality and poverty in particular have always proven both ‘fascinating’ and instructive to the better sorts in western polities, particularly during the initial period of industrial transformation in Britain. Poor law reform and sweeping social legislation went hand in hand with rapid industrial development, and a series of powerful parliamentary committees, and ever-present literary representations, contributed to how society was shaped from above largely in the interests of owners at the expense of labour. This idea of slumming it as a learning experience well predates the 19th century. My more personal answer would be that any given individual would need to be profoundly wedded to a singular idea of economic progress in order to see those two factory disasters as part of capitalism’s positive onward march. That would be a ‘growth at any cost’ idea. We often risk reductive thinking when we describe capitalism in singular terms. Unregulated developing nation capitalism can perhaps safely be separated in theory from a kind of post-growth rate western capitalism. At the end of the day I think it is appropriate to fly a flag from the mast in terms of politics. I’d be curious what people thought about the four things that I expect good history to do, as well. Fair points, Dave. I’d just note that these aren’t straw-men. Even the famed left-liberal economist Paul Krugman – a rare voice of sanity in American economic discussion in recent years – has argued for the necessity of sweatshops (‘In Praise of Cheap Labor’), though more earlier this year he modified this somewhat (‘Safer Sweatshops’). This seems to me to actually be at odds to some extent with being a ‘historian from below’. If a given historian should try and see the past from as many angles and perspectives as possible this surely includes seeing the past from the point of view of the privileged, the factory-owner, the middle-manager – the overseer of the poor. This would still include the stories of the dispossessed, but not necessarily privilege them. Indeed, one of the critiques of ‘history from below’ that I have heard a few times recently is from people who do not reject the importance of studying marginal groups, but who think we should do so in conjunction with studying elites – that we should aim for a history from all sides, not one specifically ‘from below’. I guess you could answer that by saying some historians should study history from above and others from below, which taken together create a more rounded perspective – but wouldn’t we produce better history of we all tried to incorporate multiple perspectives into out work? And if so, is ‘history from below’ a useful banner to march under? I have heard that critique of ‘from below’ as well, but I suppose to me it comes down to what the academic thinks is important enough to include and what the core groups, themes, and issues are that the academic wants to pursue. It’s about the ultimate focus of the work and not the sources or voices included to get to that end. When setting out those four points, I should be clear that they were what I expected good *history* to do, not just good history from below. I think there is an imperative to include multiple points of view where possible, but of course it is ultimately about the emphasis, or central subject, when we start to define what is history from below and what is not. Vagrants themselves are my subject, not elite or middling commentators ON vagrants, even though I take a great deal of time to assess those other groups. So my own work on vagrancy engages with elite views and popular views on rogues, &c quite a bit. I would still consider myself a historian ‘from’ below, since ultimately my aims center on rescuing what I can of vagrant experience. I just use multiple paths to get there. I personally think we do make better history when we use multiple points of view to get there. But I also think it is important to keep an eye on the prize, and the me the prize is explaining and contextualizing inequality, and recovering social experience. Thanks Dave – that sounds like an entirely sensible response to me!